Pangasinan is known for fine gray beaches spread across the Lingayen Gulf. Little would you know that further north of Pangasinan by the northernmost tip of its peninsula facing the West Philippine Sea lies a fine golden beach. Characterized by powerful waves coupled with rock formations, the only golden beach of Pangasinan is cuddling area for beach campers and water sports enthusiasts. The golden fine beach stretches at about 500 meters having its southernmost portion as a public beach. Although public, to be able to camp there, you need to pay Php 250 if you want to stay overnight to pitch a tent; or add Php 50 more for a cottage. 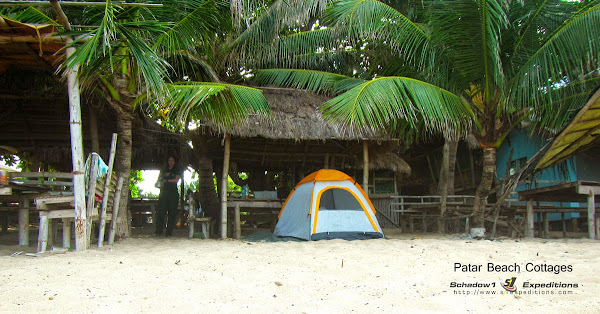 Huts are also available which costs about Php 1200 a night. Variety stores are also present to buy some of the goods you need for your camping. The remaining areas of the beach are private resorts ranging from basic to a hotel-type resort. 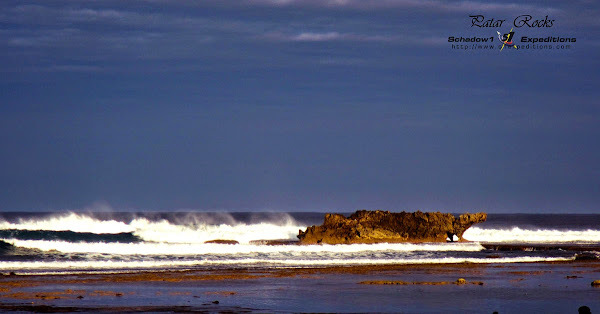 Most expensive along the area as the Treasures of Bolinao Resort which offers the best accommodation in Patar, in case you are not into beach camping. Other private beaches along the area offers cottage accommodations to simple rooms ranging from Php500 to Php1200 per night. We stayed a Nelly's White Beach Resort (Coordinates 16.30392N 119.78209E), a private beach area just next to the public beach and rented a cottage for an overnight stay. But we still preferred to pitch our tent get an ample solace under the starlit sky. Be aware that although these are private beach areas, there are no restrictions for locals to roam around the area except for the hotel. Thus if you are into a secluded beach getaway, Patar may not be able to satisfy you with that as Barangay Patar, where Patar beach is located has budding population but not as populous as its main town. Cellphone signals are intermittent to unavailable on beach areas except on the elevated area where Cape Bolinao Lighthouse stands. Although Patar is populated, it is still a laid back town where people is asleep as early as 9:00PM and the beach area becomes a quiet ground for beach campers' solitude. 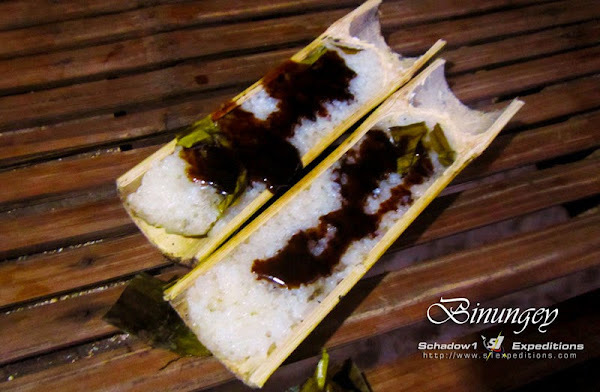 The signature delicacy of Bolinao, which is Binungey, is a rice cake topped with burnt coconut meat and brown sugar cooked inside a bamboo trunk. It is being sold by vendors walking along the beach for Php100 for 3 pieces or Php 50 per piece for the large size. Sea Urchins are also sold early in the morning as fishermen usually catch them before sunrise when it is low tide at Patar. To get to Patar Beach, you need to rent a tricycle from the main town and pay Php 250 for a 16-km ride. The road to Patar was once unpaved and a rough road but now, development has started and only a few hundred meters of it remains unpaved. Cars can now easily tread through the roads. As for ourselves, we rented a tricycle for Php 1200 for two to help us roam around the town and to all the attractions it can offer. 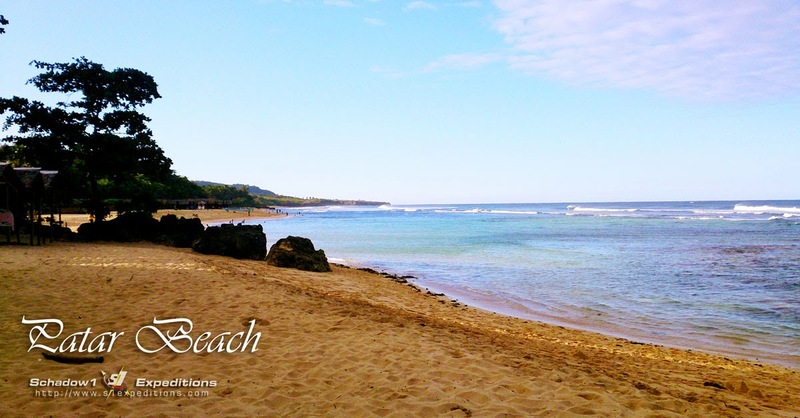 For more info on Bolinao, you can check out our travel guide here. Our mapping data is also being compiled regularly to GPS-assisted navigation devices format and can be downloaded for free on our #mapPHL page. Hi, do you happen to have a contact number to Nelly's beach resort? Thanks.